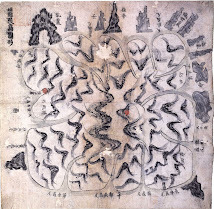 Later 1800s - "Takeshima Map Explanation" (竹島圖說), Kensaku Kanamori - "文鳳堂雑纂"
1876 July - "Argument for the Development of Matsushima"
1876 - Watanabe Kouki's "Opinion on Matsushima - 2"
1899 May - "Joseon Waterways Directory"
2007 Dec 12 - Geographical Survey Institute of Japan (国土地理院) first displays Takeshima's details in the topographical map. 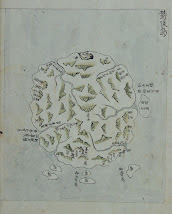 1694 Sep - "Record of Ulleungdo Mission" (蔚陵島事蹟). 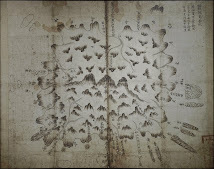 Mentions seeing an island 5km off Ulleungdo's east shore having groves of haejang bamboo. 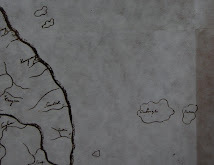 Also, the inspector mentions seeing a distant island to the east-southeast that he judged to be about 120km away. 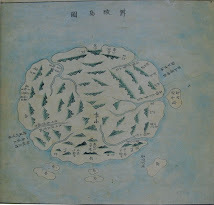 1714 Jul 22: "Visible to the east of Ulleung is an island attached to Japnese territory." 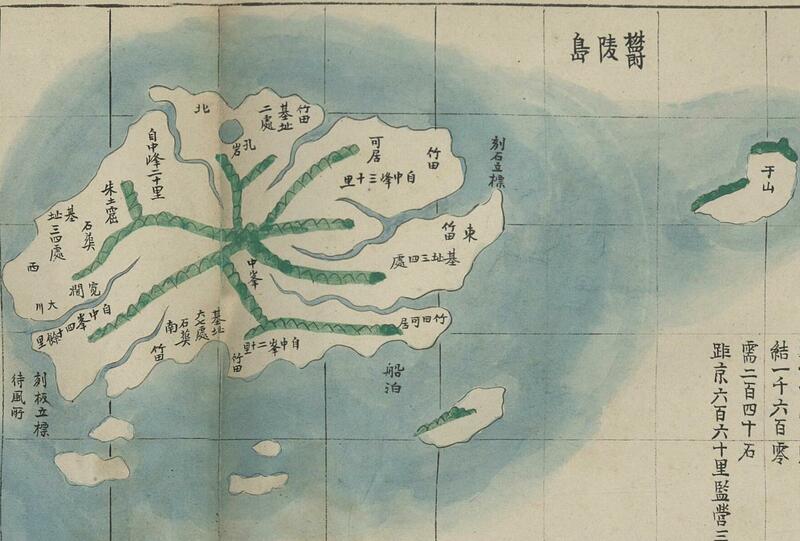 1786 June 4 - Kim Chang-yun (金昌胤) Inspects Ulleungdo. 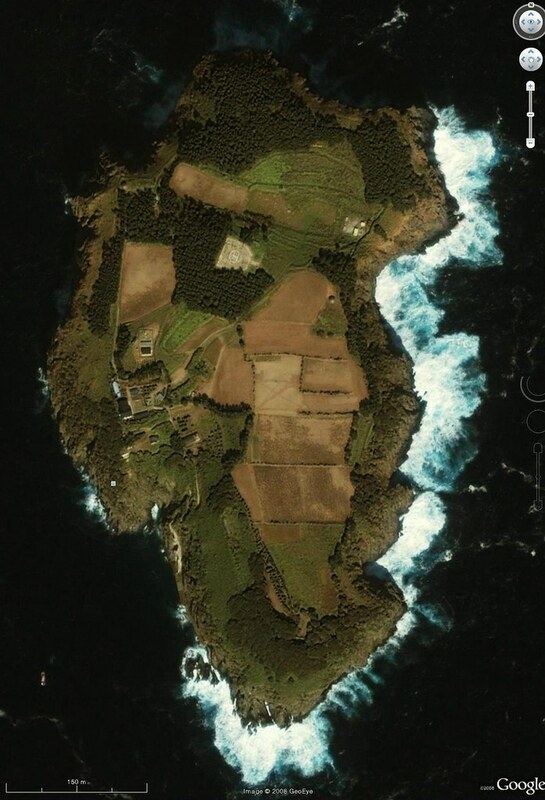 Mentions "Bangpaedo" (防牌島) is 3 ri east of main island. 1793 Oct 1 - Ilseong-rok ( 日省錄) - "Songdo (松島) another name for "Ulleungdo & surrounding islands"
1807 May 12 - Lee Tae-gun (李泰根) inspects Ulleungdo and finds Usando (于山島) as neighboring island. 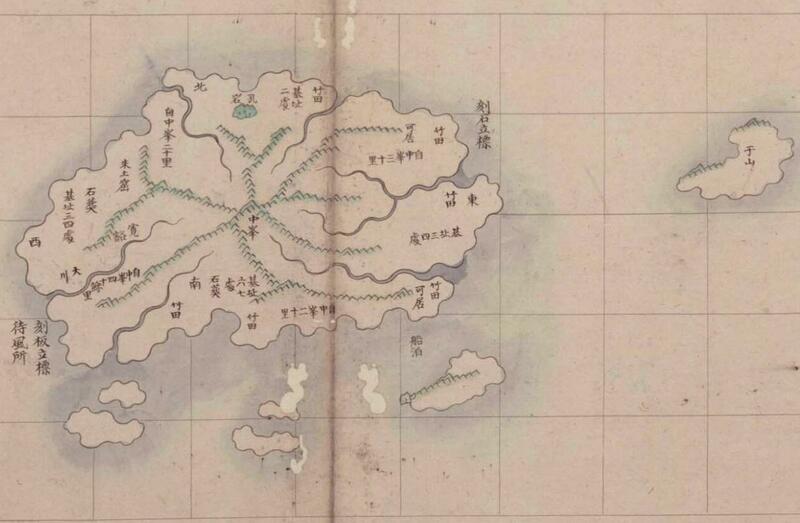 1882 April 7 - King Kojong says Usando Neighboring Island of Ulleungdo, Songjukdo (松竹島) 1.2 to 3km offshore. 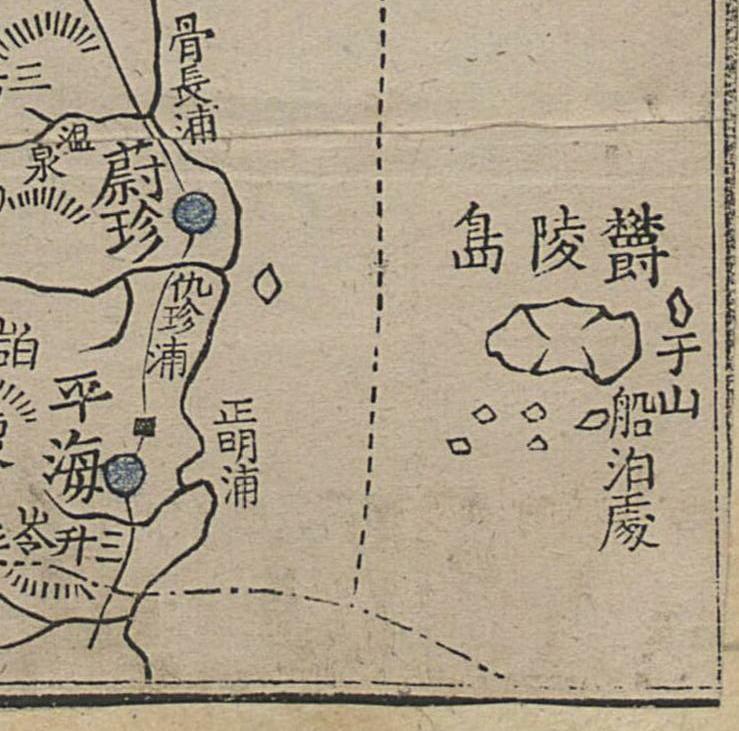 1906 July 13 - "Hwangseong Shinmun" (皇城新聞) Reports Boundry for Uldo County. Describes Uldo County as being 24km east-to-west and 16km north-to-south, excluding Liancourt Rocks. 1906 Aug - "Korea Review," Vol. 6 -- "Ul-leung Do"
1947 Sep 2 - Sok Ju-myong (石宙明)'s　"History of Ulleungdo " says that Jukdo has been the eastern edge point of Joseon. 1973 Jun 16 - "Dong-a Ilbo" Questions the Discovery of "Parangdo." Mentions that the Korean government went to historian Choi Nam-seon (崔南善) for help in determining the boundaries of Korean territory. 1902 - "On the Coasts of Cathay and Cipango Forty Years Ago"
1905 May Aug.: "The Outlook," Vol. LXXX (Page 818) mentions Liancourt Rocks with "Takeshima" in parentheses, which shows it knew of its incorporation. 1737 ~ 1776: "Gwang Yeodo" (廣輿圖). 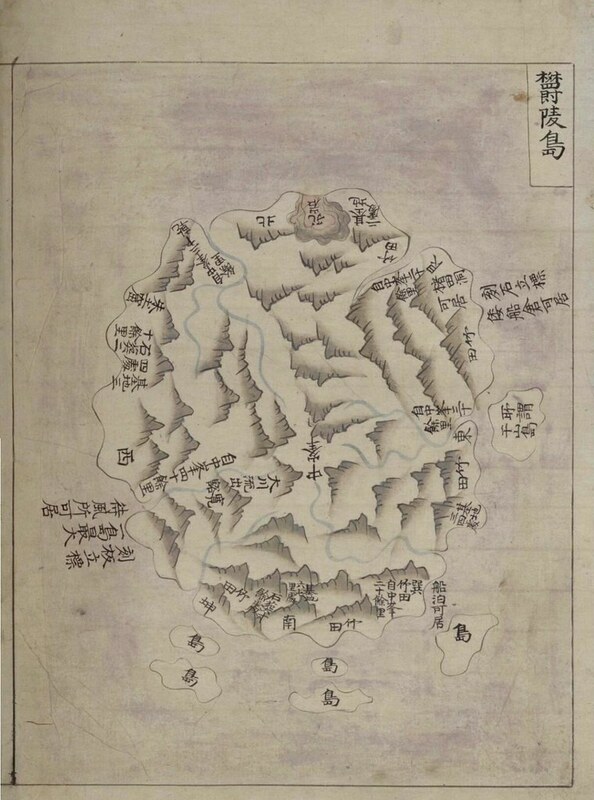 Shows a single island off the coast of Gangwon Province labeled "Ulleung/Gansando (鬱陵島-干山島). 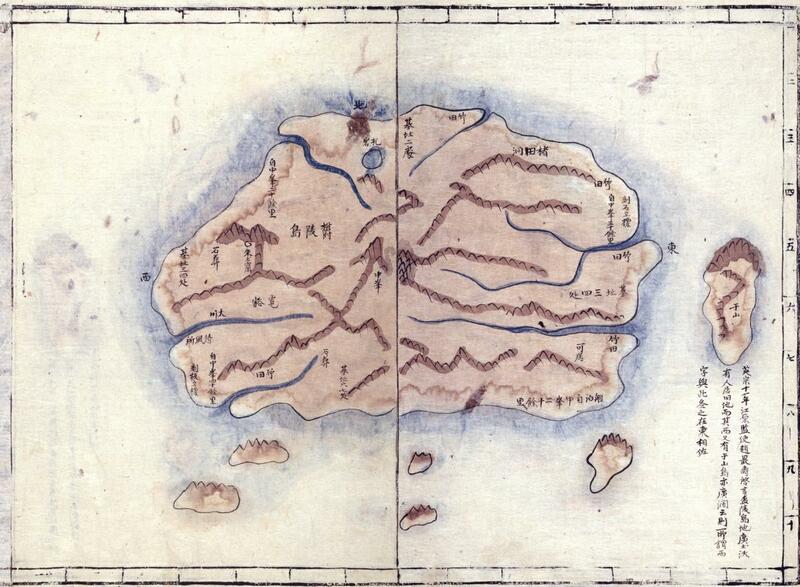 The same atlas shows Ulleungdo with a neighboring island labeled "the so-called Gansando" (所謂 干山島). 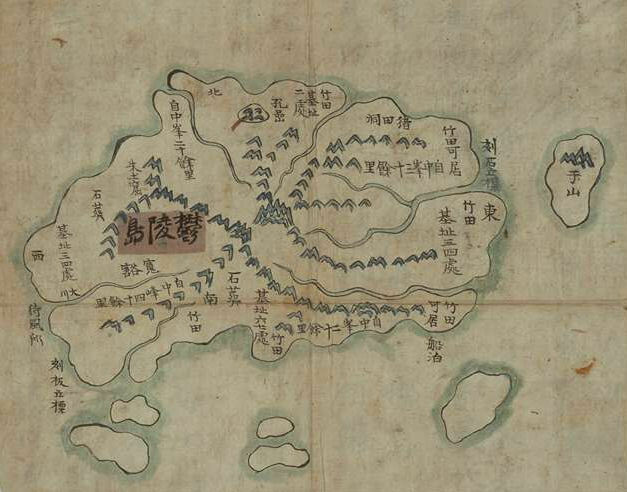 1777 ~ 1787: Haedong Yeojido (海東輿地圖) Atlas. Shows Ulleungdo with a neighboring island labeled "Usan" (于山). 1800s? 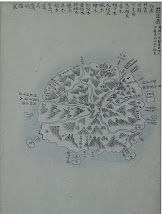 Inspection map of Ulleungdo: "Ulleungdo Dohyeong" (鬱陵島圖形). Shows Ulleungdo with neighboring islands labeled "Large Udo" (大于島) and "Little Udo" (小于島). 1834 - "Cheonggudo" (靑邱圖) by Kim Jong-ho (金正浩). Shows Ulleungdo with a neighboring island labeled "Usan" (于山). Latter 1800s? 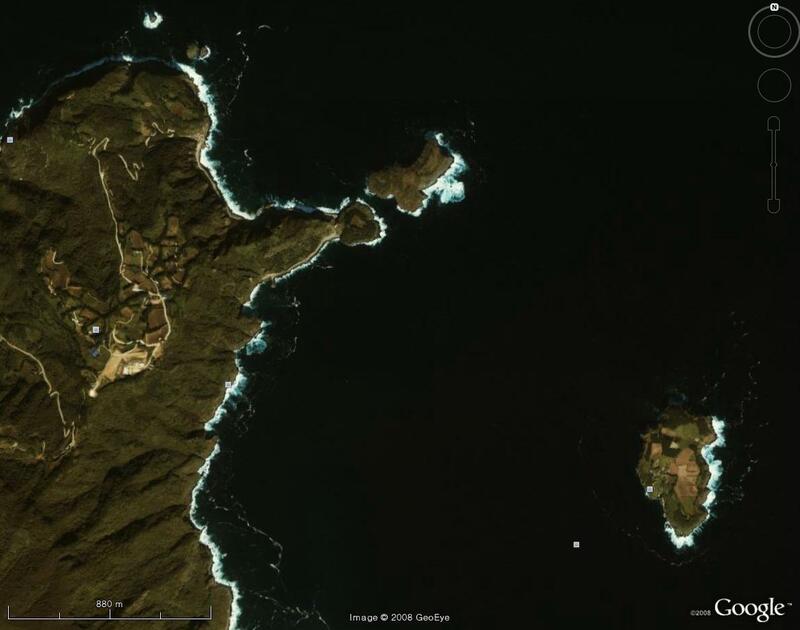 - Map of Gangwon Province, Ulleungdo, and Its Neigboring Island Usando, Gyeonghui Univ. 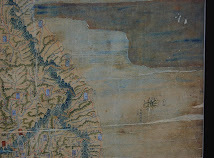 1888 - 1895 - Map of Samcheok District & Ulleungdo. 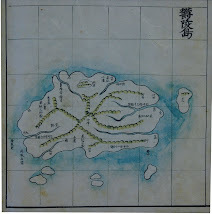 Shows Ulleungdo with a neighboring island labeled "Usan" (于山). 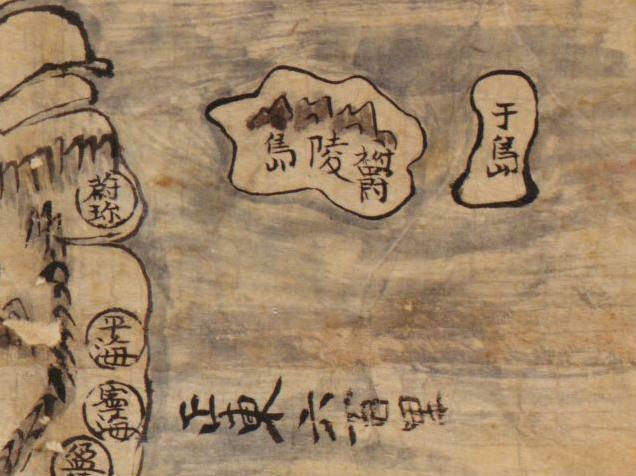 1893 "Yeoljae Chwalyo" (輿載撮要) Atlas. 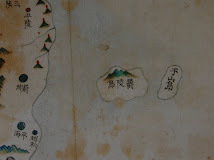 Map of Samcheok (三陟) and Ulleungdo (鬱陵島) shows Ulleungdo with a neighboring island labeled "Usan" (于山). 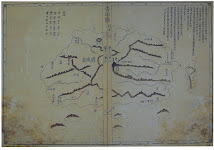 1898 - "Atlas of Joseon" (朝鮮地圖). 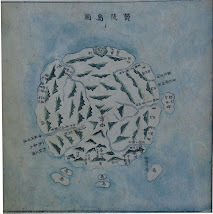 Shows Ulleungdo (鬱陵島) with a neighboring island labeled "Usan" (于山). 1901 - "Geography of the Korean Empire" (大韓地誌). 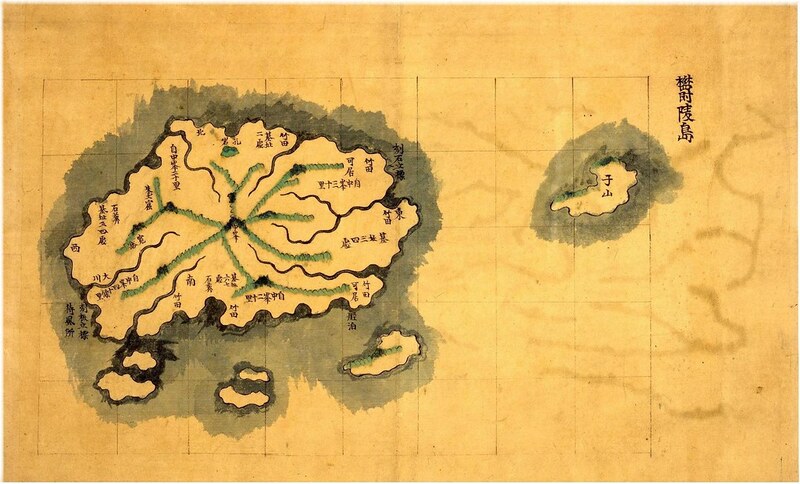 Has a map showing Ulleungdo (鬱陵島) with a neighboring island labeled "Usan" (于山). 2011 May 13 - "Dong-a Ilbo" Reports Discovery of a "Dae Dongyeojido" Map Showing "Dokdo"
Gerry, I am Sam Ahn at blog.naver.com/isoword. Please pay a visit. I have just started to destroy your arguments. So I wanted to show you general picture of your new opponent.